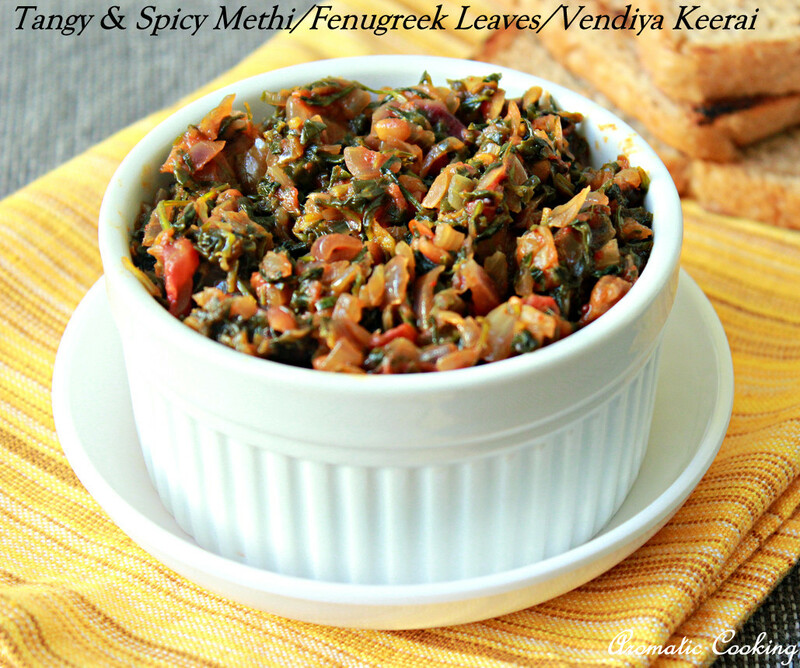 I am a big fan of Fenugreek Leaves/Methi/Vendiya Keerai, love its slight bitter taste and awesome flavor. Whenever I get them, even if I don't use them up immediately, I clean, wash, chop and store them in the freezer, it keeps well for at least 2 weeks. It tastes great in sambars, dals, curries and especially pairs very well with potatoes and paneer. 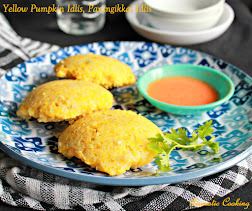 I also make this Thokku with it, the bitterness of the leaves is balanced with the tangy tomatoes and the spicy chilly powder. Can have this as a side dish for rotis, mix it with rice or even as a sandwich spread, tastes simply divine..
Heat some oil, add the mustard seeds and the urad dal. Once it starts spluttering add the asfoetida and the chopped onions and saute it for 2 or 3 minutes. Now add the chopped tomatoes along with salt, turmeric and chilly powders. Keep sauteing it until the tomatoes turn mushy, then add the washed, cleaned and chopped fenugreek leaves and mix. Add the jaggery, reduce the heat and cook it ( mixing it at intervals) till it is completely cooked and oil leaves the side. The final consistency should be that of of a spread or jam consistency. Be a little liberal with the oil, this stores well in the fridge for at least a week. You'll find fresh fenugreek leaves in Indian grocery stores, can also use the frozen ones available. Use nice ripe and tangy tomatoes for this dish, and also add chilly powder according to your spice level, the final dish will be balanced with a sweet, sour, bitter and spicy taste. 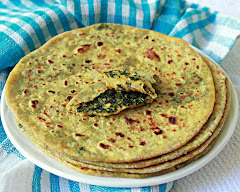 If you don't find fenugreek leaves, can do this with any kind of leafy vegetable that has a slight bitter taste, or do with chopped spinach and add a teaspoon of powdered dry fenugreek seeds or crushed kasuri methi (dried fenugreek leaves) at the end. Different one, have not tasted in this way. Should try. Yes methi combines well with potatoes n paneer...I too freeze them n use it in my sambar, curries, rice preparation etc. 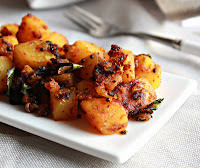 this tangy methi curry is new to me...sounds tangy n yummy...great with dosa n rotis!! Never made a thokku with methi. Love the flavour and this one should be nice too. This is new to me.. 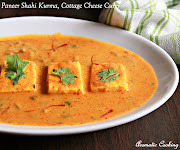 But looks so delicious and very healthy..
Drooling here seeing the clicks..Nice yummy recipe and superb clicks Hema. I love methi, this sounds good. me too a big fan of methi. I luv this dear. 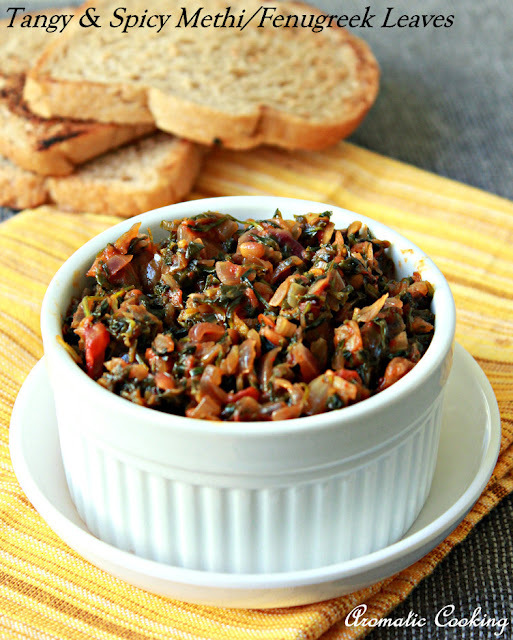 New yet simple methi recipe..Loved it & bookmarked!! 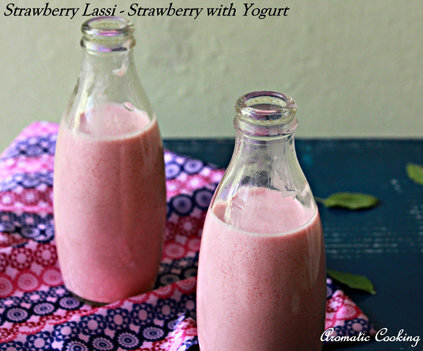 New recipe to me..looks yum!